In 1995, Indian British hotelier Sonu Shivdasani and his wife Eva reinvented the notion of island luxury with the creation of Soneva Fushi, the first ‘castaway’ resort to grace the crystalline shores of the Maldives. Hidden among dense foliage within the Baa Atoll UNESCO Biosphere Reserve on the deserted island of Kunfunadhoo, the 59-villa resort pioneered the back-to-nature, barefoot luxury trend. Fusing the Robinson Crusoe fantasy with an intelligent approach to service, aesthetic and experience, it set the standard for island resorts worldwide. Ahead of the curve since inception, the Soneva brand today comprises three resorts – two in the Maldives and one in Thailand – and is still an innovator and leader in the world of hospitality. While there are many imitators, there will only ever be one Soneva. 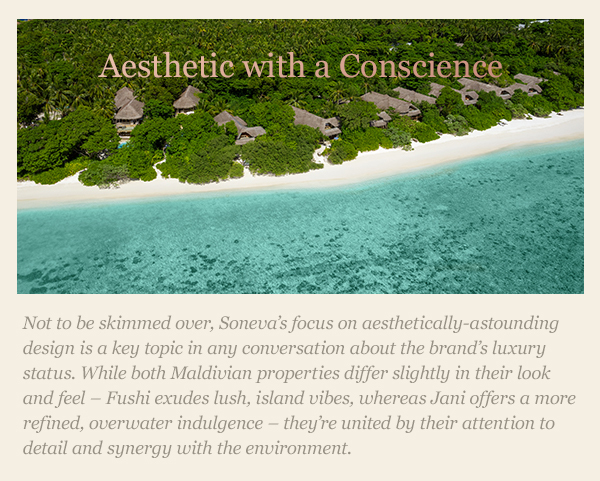 Soneva’s famed ‘intelligent luxury’ philosophy is about knowing what luxury means for guests; many of whom spend most of their time in urban environments. It’s about understanding the minutiae of their daily lives and travel needs, and catering to them in a thoughtful, personalised manner. It’s a unique concept that was borne out of Sonu and Eva’s desire to create dream destinations for those who like to travel in luxury, integrated seamlessly with their desire to protect the environment and local communities. The truly memorable thing about Soneva’s two resorts in the Maldives – Soneva Fushi and its younger sister, Soneva Jani – is that in a region famed for its high concentration of ‘luxurious’ resorts; their approach to luxury is more than just a label or marketing term, it’s part of their DNA. Each guest is made to feel like the most important person to have ever graced the resort (which was, of course, designed specifically to accommodate their every whim) and it’s this paradigm, as much as the lavish setting, that cultivates a sense of luxury. The chic and discreet décor of Soneva Jani channels Scandinavian restraint. Occupying five islets in the Noonu Atoll, this floating 26-villa paradise invites the outside in. Windows fold away, portholes in the floor reveal the marine life below and retractable ceilings unveil the starry skies above. The design is all about bright, open spaces and open-plan living. Soneva Fushi’s down-to-earth personality is reflected in its nature-inspired architecture. The spacious, laid-back villas are adorned with thatched roofs made from palm tree leaves and feature generous, open-air bathrooms. Tucked among the island’s banyan and palm trees, they all feature private paths leading directly to the soft, white sand and unfathomably blue ocean.. There are too many ‘must-do’ activities and adventures to list but for the sake of highlighting the magical opportunities available to guests, one of the most otherworldly choices is an astronomical dinner cruise. This incredible experience begins at sunset and features a four-course meal with wine pairings, while Soneva’s resident astronomer guides guests through the wonders spread above them across the night sky, sharing secrets of the cosmos. For guests seeking unparalleled romance, the private sandbank overnight experience allows them to spend a night camping under the Maldivian skies on their own private sandbank in a luxurious Bedouin-style tent, which even comes with its own toilet. To truly embody the Robinson Crusoe mentality, the castaway picnic whisks guests away to a lush, uninhabited island with a picnic basket and snorkel gear, where they’re left to enjoy their day in the sun in total privacy. There are few resorts in the world that can match the memories guests of Soneva walk away with; and that alone is a luxury.